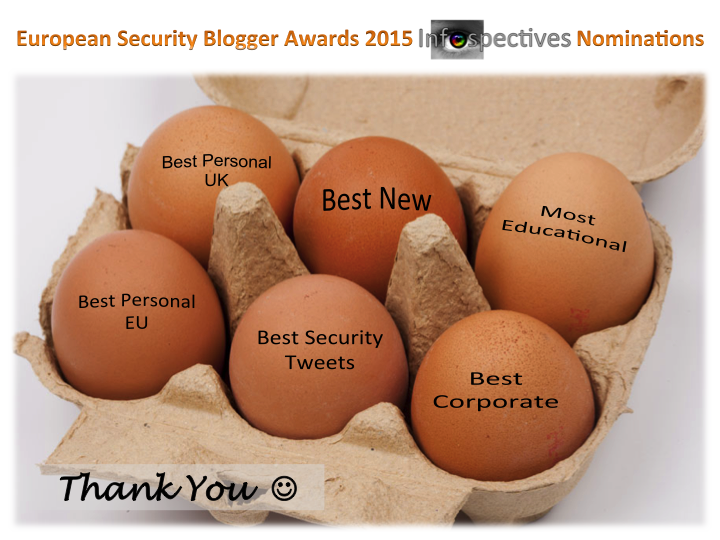 It seems only yesterday I was astounded by the social security blogger award nomination and now look what’s happened! A six pack of nominations including a personal one for me (@s_clarke22). Apart from Infospectives, you’ll find a wealth of talent and fantastic content represented in the rundown of nominees. The full list is on the InfoSecurity 2015 Blog HERE (Naked Security, BH Consulting, Graham Cluely, Thom Langford, Host Unknown TV and @circl_lu are faves of mine). This time everybody (not just bloggers and podcasters) can vote. Each and every one will be hugely appreciated (just click the button).